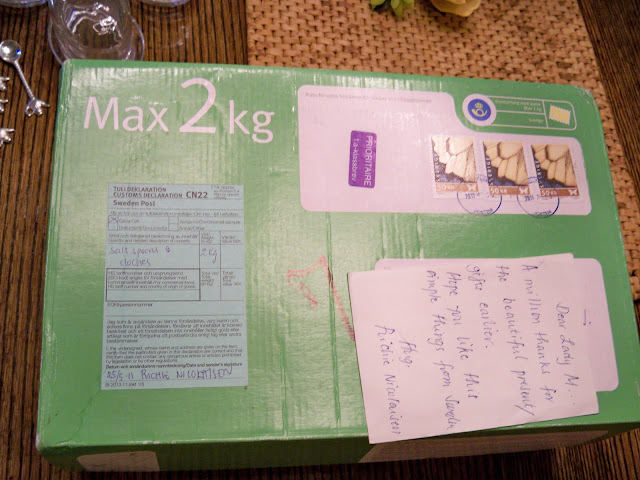 I am so fortunate to have a very special friend in Sweden that is so thoughtful and considerate. She's beautiful, talented and one of the most generous people in the whole world. Such a sweetie and I am so thrilled she is my friend. She sent me a fabuous present that has me jumping for joy. Four wonderful boxes that I couldn't wait to open. The picture had me drooling. Just look!!!!! Cloche Salt Cellars and tiny gorgeous salt spoons with teapot handles. Aren't they wonderful. I havn't ever seen any like these before, and I am so thrilled. 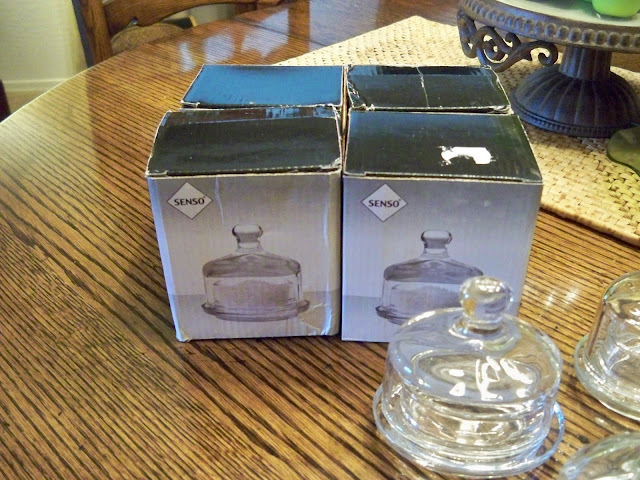 Now only a special friend would know how much I love cloches and these are just the cutest things I have ever seen. I am so excited, I just had to share. Thank you Chie, you are so special and my gift is stunning. Wow they are so beautiful. Salt cellars and cloches are two of my favorite things, seeing the two combined is just gorgeous. Love them! What is a sweet and thoughtful gift. WOOPS, I meant to say what a sweet and thoughtful gift and I forgot to mention that I adore those spoons! What fun, I can see all kind of things to show inside and use them for. Thanks for sharing. Richard at My Old Historic House. Perfect for you ~ what a thoughtful friend. I found one at an antique mall here. They called it a butter dish. No spoon with it, but I do have a little ceramic bird sitting in it right now. Your such a goodie friend that I really cheerish. I am so happy you like the simple gifts from far beyond. Happy w/end dear Lady M & enjoy. Wow!! What an awesome friend to send you such a wonderful gift!! What a very lovely gift! I know you are so excited. Oh my goodness how wonderful to have a friend like yours. These are just so unique and I too have never seen anything like them. I know receiving these must have been the highlight of your day. I love friends like this. 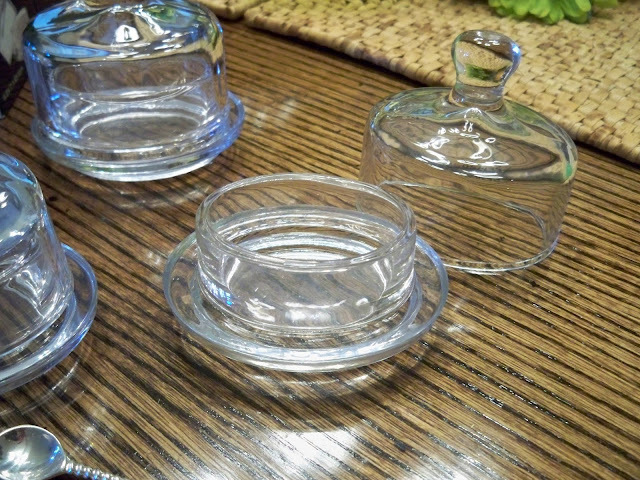 those are the cutest little salt cloches I've ever seen. Your friend has given you the perfect gift. How cute!! 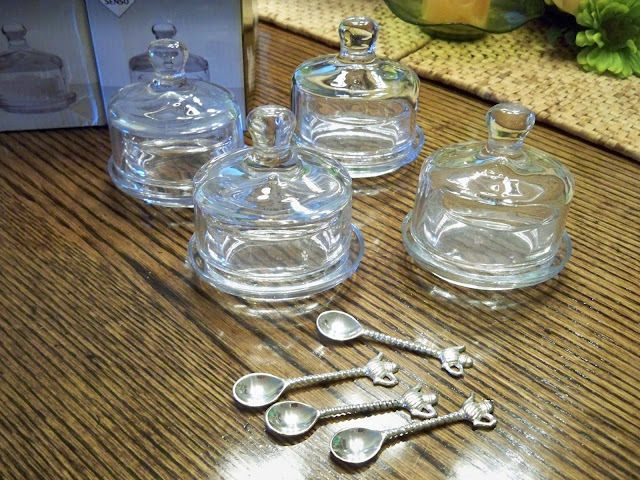 Cloche salt cellars...I've never seen any like it! Love the teeny spoons too! Wow, what a wonderful surprise gift. What a blessing it is for you to have such a special and thoughtful friend! She just made your day, didn't she. Oh, I love these! Nice!! Cute, cute, cute! What a sweet gift. The little spoons are so adorable and the mini-cloches are precious. Very Very Cute! What a sweet friend! Hi Marty. OH how cute they are,, I have never seen those either..love love the spoons... what a dear sweet friend you have..... have fun with them..
Marty, those are great. How sweet of her to send those to you. What a nice gift! 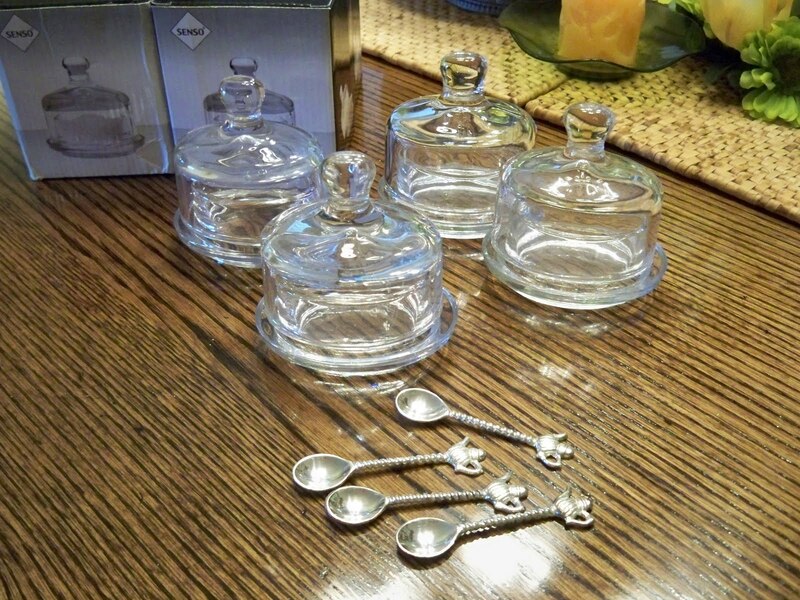 I have some of those that are similar but I use them for individual butter dishes! Good idea to use them for salt as well! Mine didn't have the tiny spoons. Lucky! :) Those are adorable! Sorry... I have linked my comments on my old blog that doesn't active. Anyhow, I got your msg. Your welcome, Lady and your worth it. Let me know if you need more of them, ok? And bcoz many of your readers´didn't see such, I might send you a set of 4 for a summer give aways. What you think. Let me know. But, before hand, I have to start to post soon. Latest tonight. So very cute! What a sweet friend! Marty those are adorable! I know you will do something so creative to share a display with them. They are perfect for you! I love the little spoons as well. What a sweet and thoughtful friend you have! How fun and what a wonderful friend! What a wonderful gift! So cute! I love your Spoons this was a lovely gift sweet lady. I hope you are having a nice weekend. See you on tuesday party. Unique, functional and beautiful! How fortunate you are to have a Swedish friend, Marty.